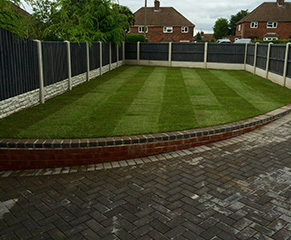 Marks Turf & Landscapes is a family run turf and landscaping company, specialising in the supply of fine turf to customers throughout Nottingham. 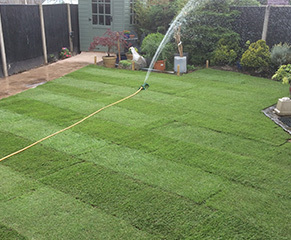 Based in Hucknall, Marks Turf & Landscapes is rapidly becoming one of the leading suppliers of turf in Nottingham, Derby and the surrounding areas. Established in 2004, Marks Turf & Landscapes have a wealth of experience in the turf and landscaping industry, completing everything from laying turf and garden maintenance to slabbing and fencing to name a few. 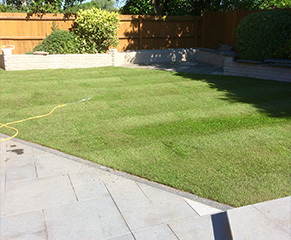 In addition to delivering quality garden turf to domestic customers, we are also able to provide a turf supply service to other landscape gardeners and gardening specialists throughout the East Midlands area. 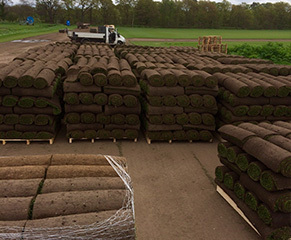 As competitively priced Turf suppliers in Nottingham, we offer a range of quality turf in small, medium and large quantities. Whether you require enough turf to cover a small front lawn or a large commercial garden, you can count on Marks Turf & Landscapes to provide a reliable supply service at a highly competitive price. At Marks Turf & Landscapes, turf is grown and sourced in Lincolnshire, a perfect geographical location for growing garden turf through a combination of rich soil and rainwater. Marks Turf & Landscapes supply 3 different styles of turf: classic, supreme and finest luxury green. With next day delivery available, we also supply many other landscapers, as they know our garden turf products are of the highest quality. At Marks Turf & Landscapes, we also offer a range of related landscaping services including the supply of topsoil, gravel, slabbing, fencing and landscaping, as well as garden maintenance.